Ongoing excavations of Maya pyramids in several locations across Guatemala have revealed two untouched tombs that have “miraculously escaped” looters’ tunnels for more than 1,300 years. The tombs, which have been dated to the era immediately before the mysterious collapse of the Maya civilization, contain treasures that will help shed light on a civil war fought between a family of ‘snake kings’ and a rival kingdom. 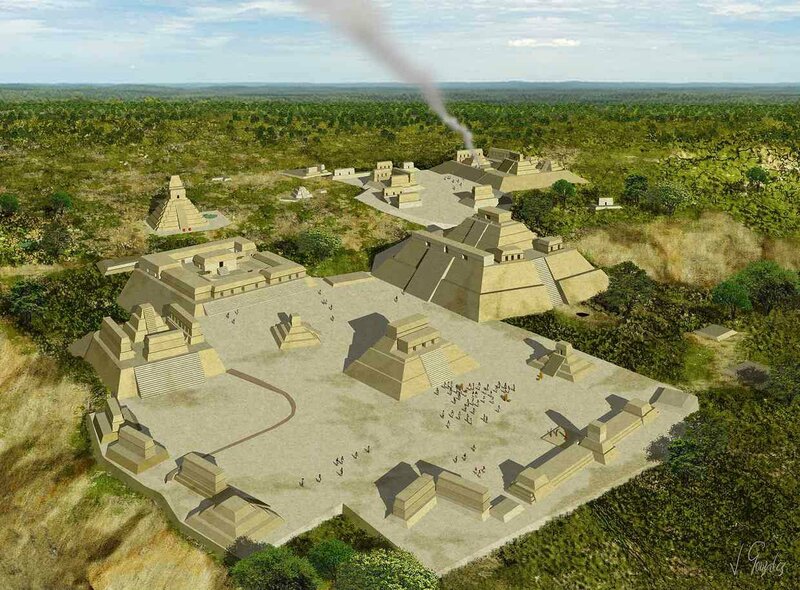 The find was made possible thanks to new technology that allows archaeologists to fire lasers at the ground from a helicopter to recreate detailed imagery of Earth’s surface, and archaeologists expect this technique to reveal far more structures from the Maya civilisation in the coming months. “We have the tip of the iceberg,” one of the archaeologists, Francisco Estrada-Belli from Boston University, told Alan Yuhas at The Guardian. Both tombs have been found in the ancient ruins of Holmul – a pre-Columbian archaeological site of the Maya civilization, dating to about 650-700 AD. The ruins are located in the Petén Basin region, about 500 km (310 miles) north of Guatemala City. The first of the two new tombs – a chamber constructed inside a pyramid – contains the skeleton of a middle-aged person with jade inlays in their teeth, and what appears to be an inscribed human tibia bone. The bone, which Estrada-Belli told The Guardian was a “very, very rare find”, could have belonged to a relative of the person buried in the tomb, or an important prisoner of war, but we should know more once the inscription has been decoded. The teeth suggest that the tomb belonged to someone in the ruling elite, as colourful inlays of jadeite, iron pyrites, hematite, turquoise, quartz, serpentine, and cinnabar were once a custom among Maya royalty. A carved frieze (pictured above) depicting five rulers was found nearby the tomb, but is thought to have been erected well before the life of whomever ended up being buried inside. The second tomb, also containing the remains of a middle-aged person, was found in a separate pyramid, and was decorated with an array of vessels and jade ornaments, including a jade necklace could be a “war trophy”, Estrada-Belli told press at a recent news conference. The team’s epigrapher, Alexandre Tokovinine, told Yuhas at The Guardian that this is the first jade artefact that has been found to mention a ‘snake king’ – part of a family that ruled the Maya empire shortly before its collapse. They used a snake-head emblem as their official sigil. “The inscription on the necklace, which holds a carved cormorant’s head that morphs into the image of a sun god, is unusual, because it belongs to a king from an entirely different city: ‘Yuknoom Ti’ Chan, Holy king of Kaanul,'” Yuhas reports. See also: A Man Fell In A Cave With 10.000 Bones. The Story Behind The Maya Human Sacrifice Is Spine-Chilling! The find suggests that the snake dynasty’s influence stretched far further than previously thought, and could be an indication that they insisted on ‘inserting themselves’ in the far reaches of their kingdoms. It’s not clear why they did this, but ‘in-fighting’ between the snake kings – hinted at by a separate discovery from a couple of months ago – could have had something to do with it. The team has yet to describe the new tombs in a peer-reviewed paper, so until then, these are just speculations. But with many similar finds expected to be uncovered in the coming months, hopefully we can soon piece together the truth of the ruling elite that existed in the final era of the Maya civilization. The Mexican Government EXPOSED Mayan Documents Proving Extraterrestrial Contact!